That’s why I always where my San Damiano Cross. It is colorful and catches people’s eye. Even yesterday while traveling two people commented. Invariably an interesting discussion ensues. An atheist once asked why he should become Catholic. What fun! Yesterday two people at the airport commented and both started a lively discussion, one with a lukewarm, unsure Catholic who was inspired by our the warm discussion. I LOVE being Catholic and love sharing it with every one. 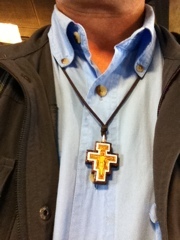 I encourage Catholics to wear their conviction around their neck. God Bless. I think I saw a bit of the San Damiano Crucifix on a ‘keys of the kingdom’, piece. at a time when people can lose their jobs/livliehood for wearing a cross or having a bible at work, this is a major witness. That is a gorgeous cross to wear. I will never forget seeing the original in Assisi. Everyone should make a pilgrimage there once in their lives! Mr. Ray, that is beautiful cross, where can I get one like the one you have? What I would give to have the gift of talking…I will pray that you come unto my people that need Christ. Safe travels, Steve !! !